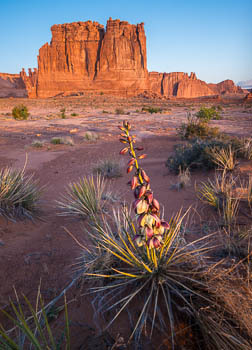 After 40 years of thinking about visiting the Colorado Plateau, I signed up for a photography workshop in Moab, Utah in early May. 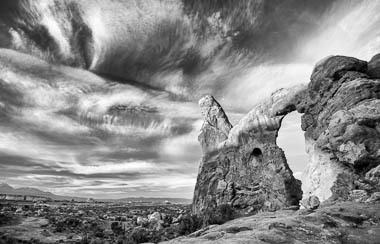 Organized by Bruce Hucko, this workshop, part of the Moab Photography Symposium, was a great way to get a running start there, with folks who really know this area well, as well as a honed, artistic eye. The three day workshop was led by veteran outdoor photographers Jack Dykinga and Jeff Foott. I'm not an early riser, but one of the first realizations is the need to get in place before sunrise (and sunset). In the morning, especially when clear, it was amazing how quickly the first light lost it's warmth and became harsh right before your eyes. Naturally, clouds could rapidly modify this scenerio and were always a welcome addition. Another aspect that was apparent was how well this landscape rendered in monochrome. This led to more exploration in the digital darkroom of Adobe Lightroom capabilities as well as a relatively new tool for me, Nik Silver Efex Pro. When the sun was out in full glory, the shaded cliff sides were often bathed in a beautiful light reflected off of the surrounding red rock, as well as the light from the blue sky. After the workshop, it was time to explore on my own. Rising early, with it windy and clear, I returned to places that we had visited. Although Arches NP is heavily visited, once you are away from the main places and trailheads, you can easily find yourself alone with the starkness and beauty. Starting at 5:30a, I explored and photographed until 11:30p. After sunset, one is treated to a celestial show. With the relatively high altitude and dry air and without the moon, stars are easily seen right down to the horizon. The camera shows many more stars, and meteors. Although the Lyrid meteor shower was probably over, nearly every photo had at least one or two meteors streaking through. 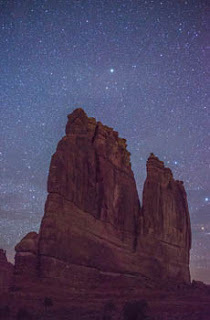 The quiet serenity at night, with the rock formations and stars was something one does not soon forget. In May, the Milky Way lies along the horizon after sunset, but there were still plenty of celestial beauty to behold. It was enchanting to work here, and I will definitely return. Jack and Jeff were great guides, critics and, most of all, engaging and humorous company.